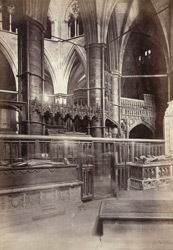 "This Chapel is immediately to the right of the Altar, and contains some interesting monuments; among others an altar-tomb, with recumbent figure of John of Eltham, Earl of Cornwall, second son of Edward II., A.D. 1334; William and Blanche, children of Edward III., A.D. 1340; William de Valence, Earl of Pembroke, A.D. 1296; Eleanor de Bohun, Duchess of Gloucester, A.D. 1399. It is also rich in brasses, among which is one commemorating R. de Waldeby, Archbishop of York, A.D. 1397; Henry Ferne, Bishop of Chester, A.D. 1661; Sir Humphry Bournchier, 1470, &c."
Westminster Abbey was founded as a monastic house by Edward the Confessor and was consecrated in AD1065. It was rebuilt in the 13th century in the French Gothic style, with a nave of great height, flying buttresses and rose windows. The monastery was dissolved by Henry VIII in 1540 and the abbey became the cathedral of the new diocese of Westminster. Most British monarchs are buried here and it has been the crowning place for all sovereigns since the 11th century.